This simple summer recipe is inspired by the Lazy Flamingo, a great bar in Bokeelia, Florida we always go to when we visit family down there. They have local, fresh grouper on the menu and you can get it grilled, blackened, or fried and served on salad, a sandwich, or just plain. My wife always gets it blackened on their Caesar salad. Here's a version of it using sous vide you can make at home. I provided a recipe for Caesar dressing but you can always use your favorite bottled dressing. You first cook the grouper with sous vide to make it tender, then quickly grill it just until it takes on some color. This recipe is great with most kinds of fish and the fish can also be finished in a hot pan or left unseared for a more delicate taste. You can also use chicken breast in the recipe for a more traditional type Caesar salad. 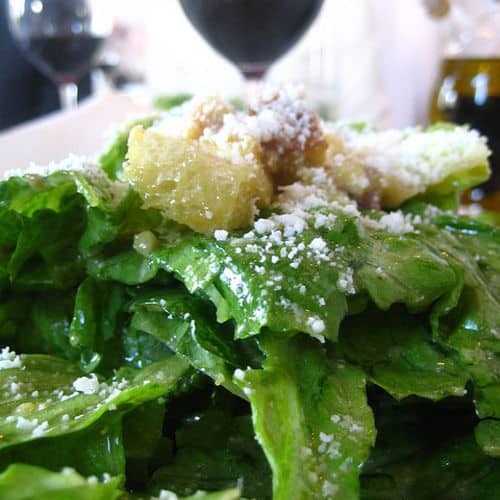 If you would like more information about the modernist techniques, ingredients, and equipment used in the Blackened Sous Vide Grouper Caesar Salad you can check out the following. This recipe is from our book Sous Vide Grilling. In a small bowl mix together the spices. Season the grouper with the salt and pepper then sprinkle with the spices. Add to the sous vide pouch along with the butter and seal. Place the sous vide pouch into the water bath and cook for 15 to 30 minutes. First, make the dressing. Place the egg yolk, anchovies, garlic, mustard and lemon juice into a food processor and process until thoroughly mixed. With the food processor still running slowly add the oil. Add salt and pepper, tasting until the seasoning is right. Take the grouper out of the pouch and pat dry. Sear the grouper over high-heat on a hot grill until just browned, about 1 minute per side. Place the lettuce in a large bowl. Add enough dressing to coat and toss the lettuce to evenly mix. Place the coated lettuce on individual plates. Top with the grouper, parmesan cheese, and croutons. Crack some fresh pepper on top and serve. Blackened sous vide grouper is great on a Caesar salad. Here's our version of it.